Artificial Intelligence (AI) and Deep Learning (DL) are transforming every industry around the world. They create the toughest workloads in modern computing history, and pose design challenges to compute, storage, and networking infrastructure that can be complex and time consuming. 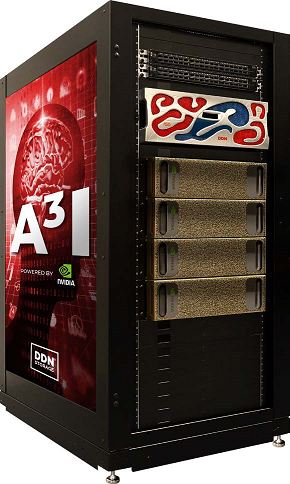 DDN A³I® solutions fully-integrate DDN Storage appliances and NVIDIA® DGX-1™ servers for rapid and simple deployment of an AI-optimized infrastructure. DDN A³I solutions deliver the fastest application performance, and scale seamlessly to meet the demands of evolving AI workloads. DDN A³I (Accelerated, Any-Scale AI) solutions break new ground for AI and DL. Engineered from the ground up for the AI-enabled data center, DDN A³I solutions with NVIDIA DGX-1 servers accelerate end-to-end data pipelines for AI and DL workloads of any scale. 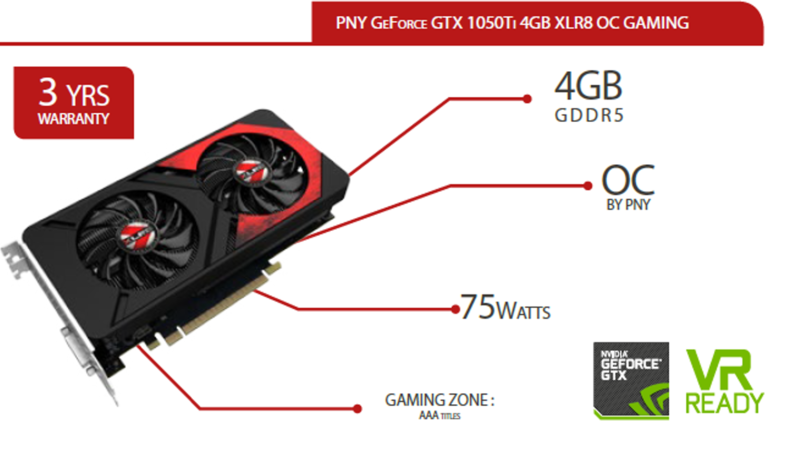 They are designed to provide extreme amounts of performance and capacity backed by a jointly engineered, validated architecture. DDN A³I with NVIDIA DGX-1 is optimized at every layer of hardware and software to ensure data delivery and storage is fast, responsive and reliable. The DDN shared parallel architecture enables full utilization of the DGX-1 GPU resources and maximizes developer productivity from every compute cycle on the DGX-1 server. DDN A³I solutions streamline DL by enabling all phases of the workflow to happen concurrently and continuously—including data ingest, curation, training, validation, inference, and simulation. With DDN A³I solutions, data is accessible simultaneously by multiple DGX-1 servers through a fully optimized and unified interface that is easy to use directly from containerized applications. DDN A³I with NVIDIA DGX-1 offers a turnkey and pre-configured solution, that is easy to deploy, shortening the timeline from AI concepts to business insights in a production setting. Based on comprehensive DDN A³I reference architectures, these solutions eliminate design guesswork, and have been validated in collaboration with NVIDIA to ensure the highest performance, optimal efficiency, and flexible growth for DGX-1 servers. Built on the NVIDIA DGX-1 AI supercomputer as it’s compute foundation, this powerful solution delivers over one petaFLOPS of DL training performance, leveraging eight NVIDIA Tesla V100 Tensor Core GPUs, configured in a hybrid cube-mesh topology using NVIDIA NVLink for an ultra-high-bandwidth, low-latency inter-GPU communications fabric. The DGX-1 architecture overcomes the performance bottlenecks of traditional GPU interconnects and offers linearly predictable performance across multiple GPUs. DGX-1 is powered by the NVIDIA DGX Software Stack which is optimized at every layer, including the most popular DL frameworks and the supporting libraries and drivers, enabling unmatched multi-GPU and multi-system training performance. To meet the requirements of a variety of workloads, DDN A³I with NVIDIA DGX-1 leverages the DDN AI200™ and AI7990™ storage appliances. The AI200 is an all-NVME, fully-integrated parallel file storage appliance that delivers 20GB/s of throughput and over 350K IOPS to applications, accelerating even the most I/O intensive workloads. The AI200 is specifically optimized to keep GPU computing resources fully utilized, ensuring maximum efficiency while easily managing tough data operations. The AI7990 is a hybrid, parallel file storage appliance that integrates both flash and deeply expandable capacity disk in a unified system for simplicity and flexibility. This integration makes it easy to collocate both hot training data and large libraries while maintaining optimal system efficiency. The AI7990 outperforms competing platforms and delivers the economics of capacity disk for your growing data library. The DDN architecture allows for instant provisioning of new resources to applications, and easy deployment of additional DGX-1 servers. Advanced monitoring tools embedded within all components of the solution provide easy data management capabilities and extensive metrics for comprehensive optimization of live workloads. Comprehensive performance and interoperability test results are available in the DDN A³I Scalable Architecture for Artificial Intelligence and Deep Learning with NVIDIA DGX-1. 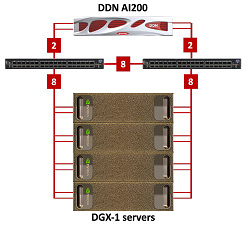 DDN A³I solutions can scale seamlessly supporting additional DGX-1 servers and AI200 and AI7990 appliances for more performance and capacity through a single unified namespace. Storage and compute are fully-interconnected through a high-performance, low-latency network using EDR InfiniBand™ or 100Gbps Ethernet. Fast and flexible access to a large and diverse data set is key to successful AI and DL efforts. The DDN high-performance parallel architecture delivers data to AI workloads with the highest bandwidth, lowest latency and maximum concurrency, ensuring full GPU resource utilization even for distributed DL training running across multiple DGX-1 servers simultaneously. As part of the solution, DDN has developed an intelligent client for DGX-1 server containers that engages multiple high-speed data paths to the storage and delivers the full performance of NVMe flash directly to the application. 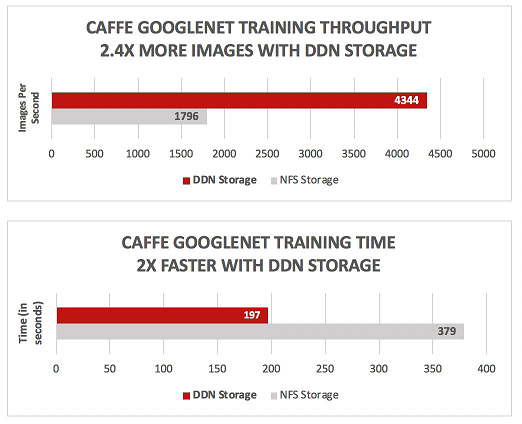 The DDN shared parallel architecture provides predictable and linear scaling of performance for training across multiple GPUs on a single DGX-1 server or multiple DGX-1 servers simultaneously. With true end-to-end parallelism, DDN A³I with NVIDIA DGX-1 eliminates the bottlenecks associated with legacy platforms. Extensive performance and interoperability testing on widely-used DL frameworks demonstrate that containerized applications can now engage the full capabilities of the data infrastructure. All applications demonstrate significantly higher performance and shorter run times with DDN A³I than with legacy competing solutions. For 20 years, DDN has designed, developed, deployed and optimized solutions that enable organizations to generate value by accelerating time to insight from their data, both on-premises and in the cloud. In combination with NVIDIA’s leadership and expertise in AI and DL, DDN has successfully deployed data-at-scale solutions for customers in all industries seeking to accelerate their business with AI and DL. Fully-integrated and optimized, DDN A³I solutions with NVIDIA are delivered and supported by expert partners worldwide, certified to provide comprehensive value-add services for enterprise. DDN A³I solutions with NVIDIA enable users and applications to easily harness the massive AI power of the DGX-1 for the most efficient utilization of GPU resources, and the fastest time-to-insights. DDN A³I solutions make AI-powered innovation easier, with faster performance, effortless scale, and simplified operations, backed by the AI infrastructure experts.